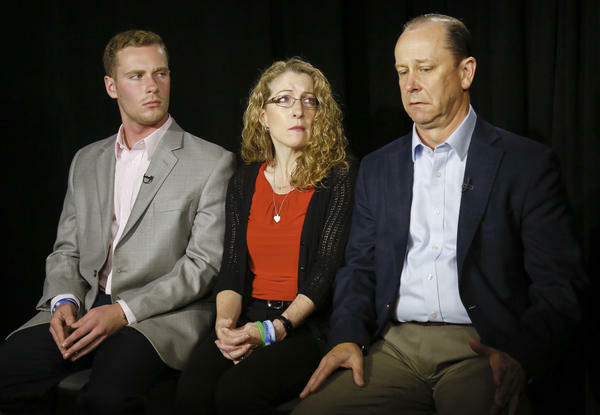 James Piazza (right) seated with wife Evelyn and son Michael speaks during an interview last year about his son Timothy, a Penn State sophomore who died after a hazing ritual. A Pennsylvania judge has dismissed the most serious charges filed against 11 members of the Beta Theta Pi fraternity in the hazing-related death of Timothy Piazza. Judge Allen Sinclair dismissed involuntary manslaughter charges filed against the fraternity brothers. But he allowed new charges of "conspiracy to commit hazing" to proceed against some of the fraternity brothers. Pennsylvania Attorney General Josh Shapiro said in a statement that he was "disappointed by the decision" and is "assessing our legal options." "We filed these charges after a comprehensive review of the case," Shapiro said. "That review is ongoing. We will move forward with our case and the charges that were held for trial today. I am disappointed by the decision of the Magisterial District Judge and we are assessing our legal options. My office is committed to seeking justice for Timothy Piazza and his family and holding responsible individuals accountable for their actions, consistent with the law and the evidence in this case." "While disappointed that the refiled involuntary manslaughter charges against the fraternity brother criminal defendants were again not sustained by Magistrate Judge Sinclair, the parents of Tim Piazza are heartened that the important newly filed conspiracy charge has now been added and will move forward to trial along with the charges of reckless endangerment and hazing. These charges carry with them significant penalties, including substantial jail time. Jim and Evelyn Piazza are optimistic that the Pennsylvania Attorney General will obtain a full measure of justice on behalf of their son, and this prosecution will eventually deter this kind of abhorrent conduct." Among the defendants is Luke Visser, who allegedly ran a beer pong table at the Beta Theta Pi house the evening Piazza was injured. In his case, conspiracy to commit hazing charges were dismissed by the judge, along with the more serious involuntary manslaughter charge. Visser's attorney Theodore Simon thanked the judge for finding again that the most serious charges against his client should be dropped. Simon wrote in a statement to NPR, "This was a sad and tragic loss of life, but not every unfortunate tragedy should result in serious criminal charges." The judge ruled Visser will continue to face charges related to furnishing a minor with alcohol. A judge is throwing out some of the most serious charges against a group of Penn State fraternity members. Those charges stem from a night of hazing and heavy drinking. That night ended with the death of a fraternity pledge. NPR's Jeff Brady has the story. JEFF BRADY, BYLINE: Prosecutors say 19-year-old pledge Timothy Piazza was served 18 drinks at the frat house in just under an hour and a half. Security cameras recorded much of the night's events. Piazza fell down a flight of stairs twice. And prosecutors say fraternity brothers didn't call for help right away. Piazza died later at a hospital from severe head and abdominal injuries. Now a Pennsylvania judge has thrown out some of the most serious counts filed against 11 fraternity brothers. LEONARD AMBROSE: But the charges shouldn't have been filed in the first place. BRADY: Attorney Leonard Ambrose represents one of the fraternity brothers, Joseph Sala. AMBROSE: The former district attorney filed charges of felony, aggravated assault, manslaughter and a host of other offenses that were all dismissed. BRADY: That was last September. The prosecutor refiled the charges, and now they've been dismissed again. Pennsylvania Attorney General Josh Shapiro took over the case when the original prosecutor lost her re-election bid. Shapiro says he's disappointed by the judge's decision and is assessing legal options. This is not the end of the case. The accused could still face jail time if found guilty of other crimes such as hazing and furnishing alcohol to minors. Tom Kline is an attorney representing Timothy Piazza's family. TOM KLINE: In the meantime, 26 individuals face 560 counts. And the Piazza family is wholeheartedly behind the prosecution not for the sake of punishment only, but for deterrence. They want to see that this never happens again. BRADY: The Piazzas are working with families of other hazing victims around the country to push for new and stricter laws aimed at preventing hazing. Jeff Brady, NPR News, Philadelphia. (SOUNDBITE OF SOULAR ORDER'S "RENASCENT") Transcript provided by NPR, Copyright NPR.